Welcome back for our second edition of THE SPACE KNOWER, a series that scours the solar system to bring you the latest and greatest in space news! I'm your host, Scoop Davis. This week our ship, the SPACE KNOWER, is at Jupiter, where NASA's Juno spacecraft just completed its 15th close flyby of the swirly gas giant. Juno has been here since 2016, orbiting Jupiter in long, egg-shaped orbits that bring it close to the planet’s cloud tops every 53 days. The goal of the mission is to learn more about where Jupiter came from, figure out what lies beneath all that gas, and finally answer the ultimate question: what makes Jupiter so Jupiter-y? What’s that big dark splotch, you may ask? Well, it's a brown barge. I'm serious; that's what scientists call it. And though this page spends a lot of words trying to explain what a brown barge is, it still doesn’t make much sense to me. 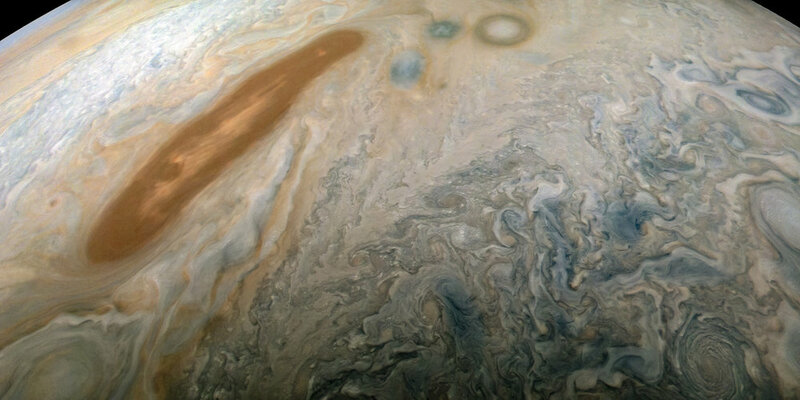 Here’s Scoop’s explanation: all of that swirly gas you see on Jupiter is in motion, like Earth’s clouds. And some of it just ends up looking like a turd once in awhile. Simple as that, folks. Engage SPACE KNOWER engines — we’re heading for Earth’s moon! That, dear readers, was a moon poem by the great Emily Dickinson. When she wrote it, she could only stare longingly at the moon from her home in Massachusetts. But how might Dickinson and other famous artists have reacted if they had been able to see the moon up close? That's exactly what a Japanese billionaire named Yusaku Maezawa wants to know. In 2023, Maezawa plans to climb aboard SpaceX's yet-to-be-built Big Falcon Spaceship (the 'F' originally stood for something else — I’m not kidding) on a 6-day trip around the moon. Maezawa, who is a prolific art collector, plans to bring six to eight artists along for the voyage, which he is calling the "Dear Moon" project. You can read all the newsy details in this article written by yours truly. We here at ROCKETGUT! are all about the combination of space, art, and culture, and are pretty excited about this idea. We'd beg Maezawa to bring us along, but there's no need — we're staring at the moon right now from the bridge of the SPACE KNOWER. It's beautiful. Okay, let's move on to our next destination: Earth orbit! Or, as Emily D. might say, let's turn our perfect face upon the world below. In our last episode, we reported on a tiny hole astronauts found in a Soyuz spacecraft attached to the International Space Station. At first it was thought that the hole came from space debris or a micrometeoroid, but then the Russians determined it came from INSIDE the station. Many questions remain: Did it happen on the ground or aboard the station? Was it an accident? Or was it ... SABOTAGE? So from there on out, Rogozin became known as the "Trampoline Guy" in U.S. space circles. Back to the present: As the investigation into the hole continues, Trampoline Guy has been leaking all sorts of juicy rumors to the Russian media about what might have happened. Among the explanations: Maybe a U.S. astronaut had mental health issues. Or maybe one was physically ill and needed to come home early, which would cost the U.S. money because we have to pay for Soyuz flights, so NASA ordered the crew to drill a hole and force an evacuation. NASA, by the way, has mostly kept quiet on all of this, since the hole was small and there doesn't appear to be any serious danger. This is the agency’s typical strategy when something Very Russian happens aboard the International Space Station. As the SPACE KNOWER goes to press, the Russians are considering a spacewalk to inspect the hole from the outside of the station. We've got one more stop. Let's bring the SPACE KNOWER down for a landing in Tucson, Ariz., near our very own ROCKETGUT! world headquarters. Your intrepid reporter recently visited The Loft Cinema, Tucson’s indie theater, for a late-night screening of Star Trek II: The Wrath of Khan. I absolutely love watching old sci-fi classics on the big screen. Whereas their slower pacing can be distracting at home, in the theater you can relax, sink into your seat, and get immersed in the world of the movie the way the director intended. "Daddy, I want another snack —"
"YOU ARE IN A POSITION TO DEMAND NOTHING." There are two things I particularly love here. When Terrell says "Admiral Kirk,” it stops Khan in his tracks to whisper, "Admiral? Admiral. Admiral." He's spent all these years obsessed with getting revenge on Kirk, and in his mind, it was Captain Kirk he was after. When he hears the words Admiral Kirk, he shows a mixture of delight at learning the information, and then kind of rolls Kirk’s title around on his tongue to sear it back into his hatred. I swear to God, I knew that line was coming, and I still jumped. I saw other people in the theater flinch, too.